You are most likely reading this because you are either an Oracle Retail customer or are about to embark on an Oracle Retail implementation. As with all major application implementations, you must make a significant investment, often of several months or more, to develop a reliable and efficient batch schedule. With CA Automic Workload Automation, you can cut the batch schedule development and implementation time to just a few weeks, and also reduce ongoing maintenance. The result is reduced total cost of ownership (TCO). This white paper describes how CA can help significantly shorten your Oracle Retail batch schedule development time. 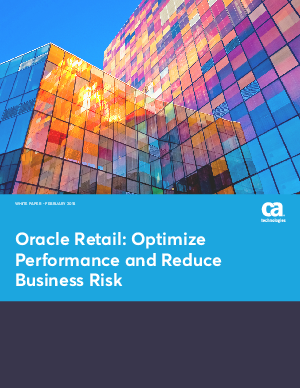 In addition, the paper describes how this Oracle Validated solution optimizes performance of Oracle Retail so your core retail processes will run faster and be more agile.